Tournament Season for Little League begins after Regular Season ends. Huguenot Little League competes in both All-Stars and Invitational Tournaments during the postseason. Teams are formed that represent our league and showcase the talents of the very best that HLL has to offer. There are two types of All-Star tournaments: District and Invitational. Between those two tournaments, HLL is able to provide an opportunity for many of the league participants to represent our league's talents on one or more of the All-Star teams. Selection to an All-Star team is indeed an honor and a privilege since you are a representative of Huguenot Little League. All-Star players, managers, and coaches should be those who demonstrate good sportsmanship, character, and the ability to play or coach. At the end of the season managers will nomitate players from their division and meet to try and rank the top twenty (20) players from the division. The purpose of the manager meeting is to have good conversation and help build the best all around team to represnet the Huguenot Little League in tournament play. The manager selects their top 12-15 players from the top twenty and submits the roster the player agent and the board of directors for review and approval. Once the roster is approved players are notified of the selection and have to be able to comitt to the teams tournament practice and play, and it isn't a small comittment. Once the roster has been finalized the team will meet, submit required documentation (birth certificate and proof of residency), pay little league fees (usually around $100) and have a team meeting before kicking off practices to prepare for the tournament. Managers and coaches can only vote for players in their eligible divisions/age groups. The HLL Board retains all rights and responsibilities to populate these teams in the event of unforeseen circumstances including but not limited to "popularity contests" or chosen players not available for tournament play. Little League requires that every player who participates on an All-Star team provide their original birth certificate as part of the verification process. This requirement is above and beyond the basic registration process to participate in the spring and fall seasons. There is no room for negotiation, an original birth certificate must be provided. Little League determines the dates for all the age groups and that sets ball rolling for the play in tournaments. To play into a Little Leage World Series you must win your District (for HLL that is Distict 5). From there you advance to the State Tournament where you face the best teams in Virginia and to advance, you must win that tournament. Once you win a state you are going to start getting visibility on ESPN with the Southeast Regional Championship. Win the regional, and it's off to Williamsport to participate in the Little League World Series! For teams fortunate to make it through to Williamsport it is a experience of lifetime but you will play a lot of high caliber baseball along the way. Typically our teams are competetive in Districit 5 but don't advance to the state tournament that often (at least not yet!). 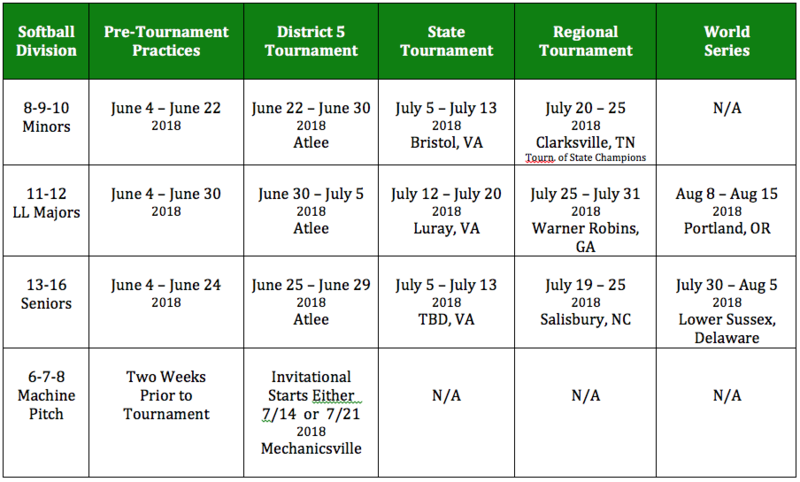 Now that you understand the road the world series scheduling the tournaments happens in the revers order ... LLWS --> Southeast Region --> District 5 and therefore the dates for tournaments usually don't get anounced until early spring. Below is a representation of the projected schedules for rough planning and we'll update this page once dates are made public. Note: D5 Tournaments will begin rouglhy in late June to early July. Division specific dates will be listed on the D5 website once they are determined. Once D5 updates their site, select the "District Tournament Date & Bracket" link to see bracket information which includes dates & times.